Few people know that beneath the busy streets of Naples lies an extraordinary subterranean art collection, open to any curious traveller for the price of a metro ticket. 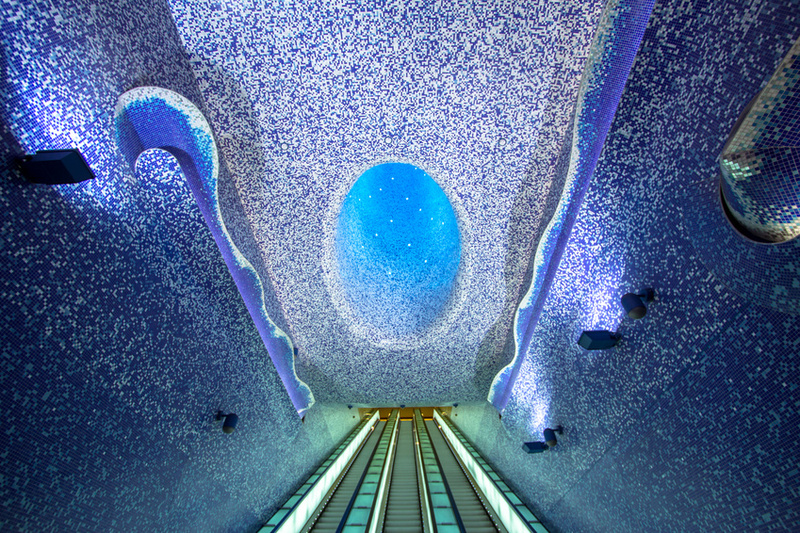 Toledo station, designed by Catalan architect Oscar Tusquets Blanca and curated by Italian art critic Achille Bonito Oliva, has been described as “the most beautiful subway stop in Europe”. Wrapped around the entrance hall is an ornate mosaic designed by South African artist William Kentridge, depicting the Naples Procession led by San Gennaro. Figures from Italian history and blood-red musical scores are woven with maps of the city’s first underground rail system: all tiled by hand in the style of the Cosmati masters. Materials and colours in Toledo station move down through black asphalt to ochre and finally azure, representing the earth’s strata. Descending the escalator, you can gaze up through the cavernous Cratere di Luce (Crater of Light) to the sunshine above. Moving walkways between platforms double as immersive installations. Ponder giant portraits from cultures around the world in The Human Race by Oliviero Toscani; walk on water through By The Sea…You And Me, shimmering oceanic panels by Texan artist Robert Wilson. 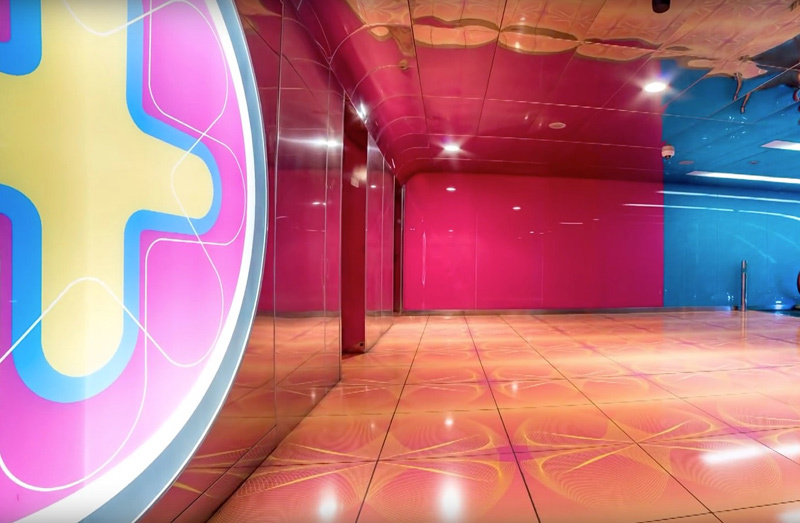 At the kaleidoscopic Università station, Egyptian architect Karim Rashid has created a thoroughly psychedelic commute. In this steel hall of mirrors, pink and purple walls glisten like pulled sugar. 3D shapes animate as you walk by, exploring the language of our new digital era. Beyond the turnstiles you’ll meet Rashid’s Conversational Profile, polished black pillar-sculptures in the futurist style of Bertelli’s famous Continuous Profile of Mussolini. And at the exit stairways, each step shows a slice of a screenprint homage to Dante and his beloved muse Beatrice. If you’re visiting the Museo Archeologico Nazionale on your trip, go via the Museo station to see Mimmo Jodice’s mesmerizing, torchlit photos of ancient bronze statues. A perfect opener for the Farnese Hercules that greets you, fresh from killing his lion, in the museum’s atrium. A highlight of the Quattro Giornate station on Line 1 is Marisa Albanese’s celestial Combattenti (Fighters). Sitting weightless above the escalators, the sculptures are dedicated to the women of the Italian Resistance—their unsung strength during the WWII uprising of Naples in September 1943. There are currently 14 ‘art stations’ distributed along lines 1 and 6 of the Metro network, featuring more than 180 works by 90 international artists and architects. Two new stations, dedicated to the city’s archaeological treasures, are currently in planning. Duomo station will be built around the excavations of a 1st-century temple and athletic race track; Municipio will showcase, among other precious artefacts, the preserved skeletons of three Roman ships. For more information and images of the art stations view RAI TV’s excellent video. The metro is open 6:00 to 23:00 every day of the year. A travelcard, valid for one day, costs 3.50 Euro.